John says Da is trying to get votes.. she told him she knows who has the power and she needs his vote to stay. JohnnyMAc – I’m going to vote her out still. Becky says what Shelli did with her HOH was not what they had agreed on. Becky says she won HOH because she wanted to get Audrey out to show the house she’s on the same page as them all and willing to work with them. Jeff says they need to make an apology to the women for last nights podcast. Jeff says it was more James but they all sink together..
Jeff has a new idea for something to do called “A walk in heels” involves the guys dressing up as girls. The houseguests don’t seem too excited about this.. they suggest they just do speed dating. The plan is to do Speed dating tonight at 10 after it’s done the girls will say which guy date they liked. Jason doesn’t see it worthwhile to participate because he has no idea what to do on a date with a women. LIz saying that Audrey came up to her and told her the Podcast last night was awkward. Liz explains that she never told Audrey she was voting to keep Day but Audrey is still running around telling people that she was. Austin says Audrey told people the both of them are voting to keep Da. Austin is done with her. Jackie complaining about Audrey. Jackie leaves.. Audrey comes in. Audrey asks her if she can kick Clay out for one night.. Says the have nots are making a big deal about having to sleep with Audrey. Shelli – who is it.. They are trying to get Steve to do it and he’s saying he doesn’t want to sleep with a girl. Audrey says they are all making a big deal about sleeping with her and making jokes. They start talking about the last laugh. Audrey thinks it’s Becky or Steve that have it. Audrey says Da was thinking she had Becky, Jackie, Steve, Liz and Jason but today she found out she didn’t have it. Audrey can now tell Da knows she doesn’t have the votes. Audrey now saying once Da leaves the drama around Audrey is going to die down a lot. Shelli asks her if she ever not talk/think about Game. Audrey says when her back is against the wall and everyone is against her she has to. Audrey says she thought that during the podcast they were trying to poke fun at her for the dreams. Audrey says her parents are sending her telepathic messages tells her to get out of the house. Says her mom is watching the feeds and is a nervous wreck. Audrey says she trusts Clay, Shelli, Vanessa and JohnnyMac. Audrey – I’m getting the sense he’s starting to trust Austin more.. Jeff is doing a good job he’s a great politician. Audrey says John feels good about Becky and Steve and he trusts Jeff. Shelli wants Audrey gone next week. They start talking about Audrey spreading “Bullsh1t” throughout the house trying to get everyone to target each other. 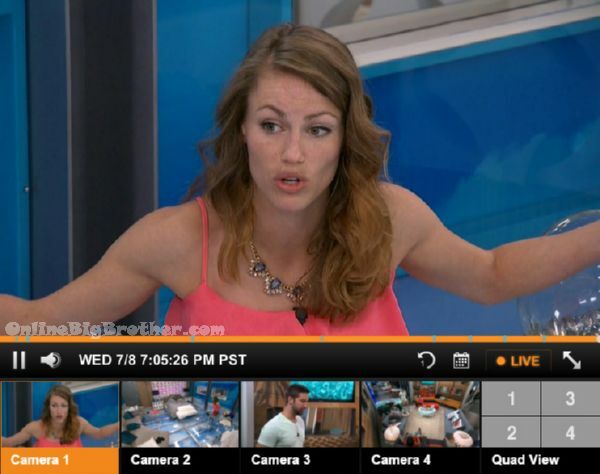 Becky says Audrey said just right now that Jackie and Steve are voting to keep Da. Becky says Audrey is trying to get Da to blow up. They agree Audrey out before Liz. what fans are the BB producers contacting? i’m baffled by this.. I am sure that a number of you noticed Big Brother Fan Favorite? Frankie in the front row last week, when Jace was evicted. I wonder how Frankie finds time to fly back to the States, when building schools in Africa must be monopolizing his time. After a couple of weeks it is hard not to like Vanessa’s game. Rudyard Kipling had someone like Vanessa in mind, when he said: If you can keep your head, when all about you are losing theirs ………….. I didn’t know Africa had moved to West Hollywood? Frankie has moved to West Hollywood and has become a professional Gay Hanger Onner. He is a West Hollywood Club boy. Fan Favorite must be the same thing as Fan Favorite Battle of the Block. Frankie was despised on all of the boards universally disliked. So bad when he got evicted the had to screen the audience for people that might BOO him. Vanessa is the best player in the game… but this is one of the most disloyal houses I have seen in years… even her game might get blown up especially if Jeff, Audrey and Clay stay in that house. It is harder to say what is going on because 98% of the house are reactors not long term strategists, so it just takes one little blow up and Vanessa might be screwed. as confusing as it is this Season even though the first two evictions were guaranteed right after the PoV, this house is about to blow up and collateral damage will be everywhere. Frankie did not move to West Hollywood after BigBrother…he was always Bi-Coastal and has homes in both New York and shared a home with his sister in L.A. Also, if you are gay in L.A. Everybody knows the hot gay clubs are in Boystown! I grew up there in the vicinity and I would be surprised if he didn’t hang in the best Dance Clubs around! L.A is fun for young, cute hot boys and girls! Sorry!!! This is NOT the BigBrother House and the American audience is large and diverse! I am one of many people who loved Frankie in the house! I love how Shelli still thinks she is running everything, even their so called alliance of Shelli, Clay, Austin, Audrey and Vanessa. I think that Clay and Shelli have left a bad taste in everyone’s mouth, and could not be in the great position she seems to think they are in at the present moment. If Becky hadn’t been so gracious when Shelli screwed her on the HOH nominations they could conceivably have been in a bad situation this week. I guess we will see how they have come off after the next HOH, and whether one or both of them shows up on the block. I do know that James and Jason are livid with them, and will not forget it. It would have to be Jason or James who takes the first whack at Shelli and/or Clay. The rest will not. I’d love to see them both on the block. I don’t like the smugness and the power trip they are riding so soon in the season. Maybe if there were a few more wins/successes for them both, they’d be somewhat entitled to it. Right now they just come off as entitled, period. Just a question for Simon and Dawg. I like most of the house guest in here, and I have to root for Clay because I’m an Aggie. (Gig’Em) Do you think that because of all the flip flop alliances in the past few years that once a number of houseguest are eliminated that BB would then insert a past alliance into the game as a twist? Something like the Black Widow, or Horsemen….maybe The Brigade. Wouldn’t it be funny if Liz & Audrey both win the HOH ! I’m sure you can see the podcast on the feeds, is it any good? If it’s like the Becky took a train to the face story, I’d watch that everyday, but if it’s more about asking which guy the girls would make out with then I can live without it. I wish Shelli had backdoored Clay. I can’t stand him! Shelli is too old to let that little boy do the talking for her! He is ruining her game. She should have stuck with the girls! Those two are putting a giant Bullseye on their backs. if not for Audrey being so awkward and inept with her lies, Shelli and Clay might be targets #1&2! Wouldn’t it be great if Johnny Mac won HOH & demanded that Shelli & Clay went up as pawns & threw the BOB? Would love to hear that conversation!!!!!!!!!! Okay, I must admit that this year is turning out okay. Day leaves tomorrow, then what…..
i’m loving this season so far too, and i think a big part of it is because of how audrey’s game is so bad it’s gone back to good, with people proffering her as a backdoor target just to blindside a “pawn” or bigger threat. it has a lot of potential if more than just clay and shelli start doing it and might provoke battlelines between the house instead of the kumbaya crap we’ve gotten the past few seasons. Love the podcast, Jeff got that on lockdown too. Good lookin out producers. Audrey is one messed up human being. It’s amazing they let someone that unstable on the show. I cannot wait for Jeff, Shelli, and Clay to be on slop and on the block. Jeff creeps me out! He is the kind of weak chinned guy who thinks he’s God’s gift to women and needs to do a whole ton of growing up! He is the definition of misogyny! I often wonder what happened to the good ‘ol days when we had votes of 5-4… Or, 9-2… Something other than a consensus vote…gets boring on Thursday’s knowing the House is voting together as cowards! I can’t wait until the next house guest wins HOH, and the same comments get regurgitated! Oh they think they are in power….. Blah blah!